It is now widely acknowledged that the Western world has been transitioning into a "postmodern" context for some time. Many, if not most, of the commitments that gained ascendancy during the Enlightenment are rapidly changing--including but not limited to our cultural sensibilities, manufacturing practices, philosophical theories, and political forms. Given these shifts, the challenge for Christians of all stripes is to strive to faithfully engage this world without acquiescence or retreat. 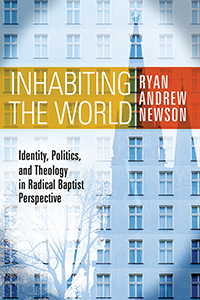 In INHABITING THE WORLD, Ryan Newson argues that resources contained in the "baptist vision" of Christian life are uniquely helpful in describing how Christians might transformatively and receptively inhabit the world as it now is. Newson unpacks the contours of a Christian identity centered around listening--to oneself, to others, and to the wild voice of God--and focuses his argument by engaging the work of theologian James Wm. McClendon, Jr. No mere "report" on McClendon's thought, however, Newson pushes back on and creatively extends McClendon's work, including into the fields of neuroscience, political theology, church practices, and ecclesial failure. Crucially, Newson's concern is less with what this tradition has always said and more with what we should say moving forward, outlining a positive vision that goes beyond merely saying what we are against. Altogether, he unpacks what a radical Baptist identity for today might look like while seeking to avoid many of the dead ends and false starts often associated with this tradition. From a rich store of learning and deep engagement with James Wm. McClendon, Jr.’s baptist vision, Ryan Newson offers a constructive path for renewing our work as theologians. Listening, an embodied practice, is the key to his methodology, which surely summons a more humble posture in a world of competing views. Of most interest to me was his perceptive guidance for how to access the resources churches need to inhabit the world more fully, with compelling identity and witness as people of the resurrection. Ryan Newson thoughtfully explores and creatively extends the work of baptist (and Baptist) theologian James Wm. McClendon, Jr. This book shows how nuanced, challenging, and insightful this distinctive approach can be. Catholic, Protestant, Reformed, and Baptist theologians should read this text. They may not agree with all it says, but will come away from wrestling with it better able to articulate what it means to be a Christian today. A splendid contribution! Ryan Newson is uniquely qualified to carry on the task of articulating a baptist identity in the wake of what Stephen Toulmin called the structural timbers of modern thought. Newson is doing in this book exactly what James Wm. McClendon, Jr. would have wanted. I strongly endorse the work done here. INHABITING THE WORLD is just the kind of reflection that progressive baptists need for inhabiting the postmodern condition. It is a masterful extension of James Wm. McClendon, Jr.'s important baptist theology that draws on the best of this tradition in being convictional but also open to the world, in valuing the power of Scripture but caring about the complexity of interpretation, in respecting the freedom of convictions but setting them within community and hospitality to others. Newson’s theology of listening skillfully navigates issues of identity and pluralism, practices and their abuses, and the individual and community. His is a voice to which we need to listen.